We are thrilled to announce that The Weather Channel, a top-15 destination on the Web, has adopted the Brightcove Internet TV platform to launch a number of new, ad-supported broadband video channels. 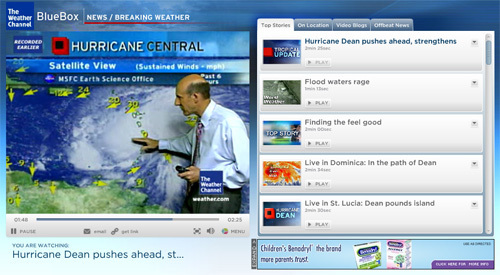 With Brightcove, The Weather Channel is distributing an enormous volume of frequently updated video content, featuring breaking weather news, video blogs and local coverage. Visitors to the site can easily search and tab through video content and share videos with friends and family.